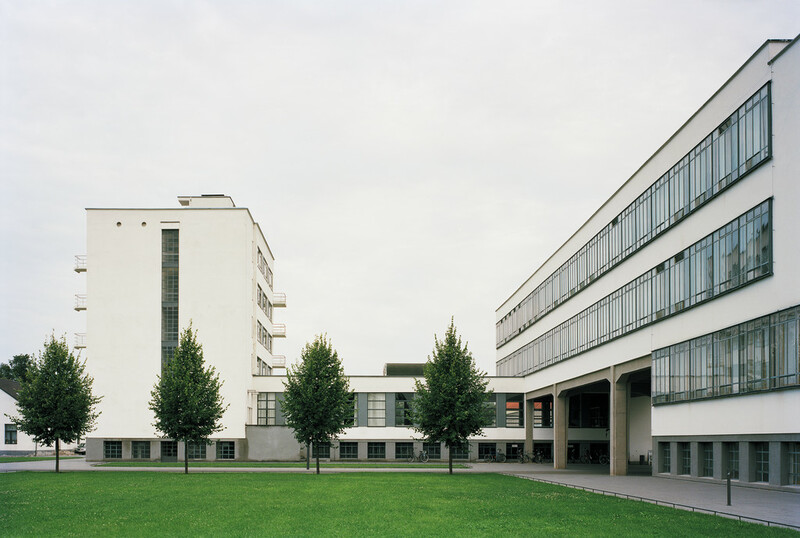 Left: Bauhaus Dessau. 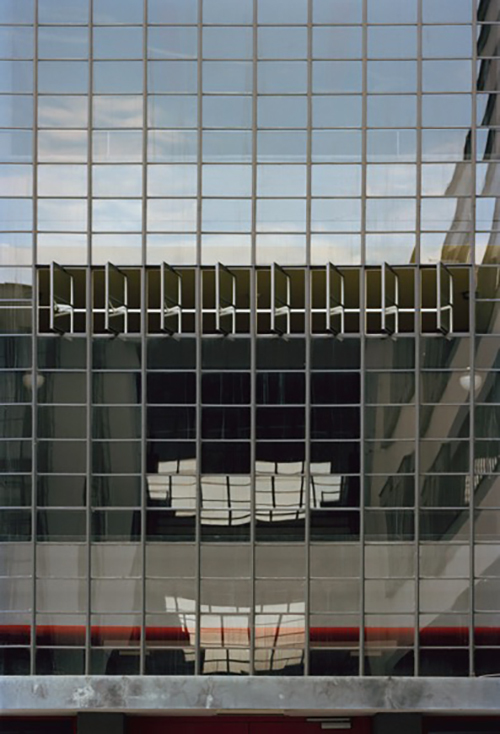 Courtesy of Bauhaus Dessau Foundation, photograph: Yvonne Tenschert, 2011. Right: Looking up at the Price Tower. Courtesy Price Tower Arts Center, photograph: Mark Rains, 2006. Think “architectural conservation.” What comes to mind might be a craftsperson standing on a ladder, tool in hand, working to repair a deteriorating wall. That image does represent an important part of conservation—the physical act of preserving a building—but it’s actually only one small facet of a much larger process. One of the most important steps in the process of ensuring a building’s long-term preservation is the creation of a conservation management plan (CMP). This document comprehensively determines and details conservation policies that guide any future conservation interventions and maintenance schedules. Trying to preserve a building without a CMP is like trying to make bread without a recipe. The best conservation projects plan ahead by relying on information gathering and fact finding. This involves sifting through historical archives, consulting old photographs, performing lab tests on original materials, and cataloguing previous repairs and renovations, etc. Professionals synthesize this information and then create a statement of significance, develop conservation policies to inform decision making, and set priorities about how to best care for a building. CMPs are particularly important for modern architecture. We know more about buildings constructed in the last 100 years than ever before. In many cases, we also know about the intent of the architect behind a famous building’s design, which is just as important as its material form. Sound interventions require solid planning, usually executed by a team that brings together various areas of expertise: conservation, engineering, history, and material science, to name a few. Doing that requires resources, which is why the Getty Foundation, as part of its Keeping It Modern initiative, is helping a number of modern architecture sites around the world to develop CMPs. To share how the creation of a CMP will ensure that two architecturally significant structures will stand the test of time, let’s consider two of the 2017 Keeping It Modern projects—both of which have received funding specifically to create a CMP. Bauhaus Building Dessau, 2013. Courtesy of Bauhaus Dessau Foundation, photograph: Nikolaus Brade. Designed by Walter Gropius in 1925 to house the world’s most progressive school of art and architecture of the time, the Bauhaus Building in Dessau, Germany is an icon of the modern movement with its sleek combination of steel, concrete, and glass. The Bauhaus is the preeminent symbol of modern architecture in part because of Gropius’s innovative engineering techniques. The school’s large skeleton is crafted out of steel, brick, and reinforced concrete, which reduced the number of interior load-bearing walls and allowed for large areas of open space—unprecedented in architecture previously. The exterior is comprised of glass curtain walls—one of the earliest examples of this characteristic modernist feature—which bring ample sunlight inside. Exterior of glass curtain wall from the Bauhaus Building Dessau, 2013. Courtesy of Bauhaus Dessau Foundation, photograph: Nikolaus Brade. Another defining element of the Bauhaus that profoundly impacted the future of twentieth-century modern architecture was the careful attention Gropius paid to fixtures and features. 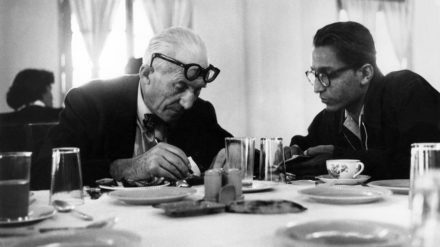 Gropius made a point of pulling in the abundant talents of his fellow Bauhaus faculty to devise the school’s lighting, wall color schemes, chairs, and even door handles. Without these features, the Bauhaus is not the Bauhaus. And the CMP that is being supported by a Getty grant will account for these details, and more. 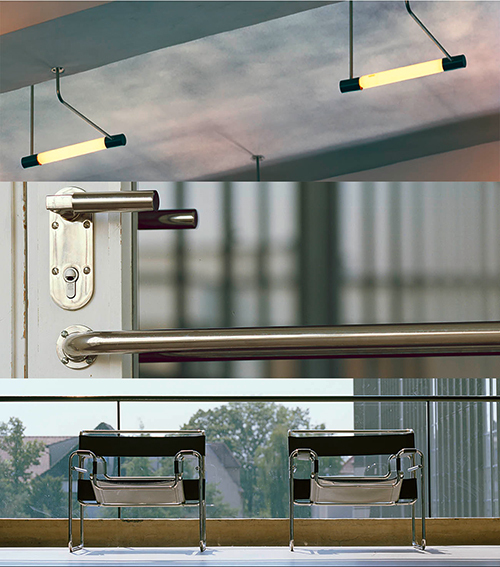 Light fixtures, door handles, and chairs designed for the Bauhaus Building Dessau, 2013. Courtesy of Bauhaus Dessau Foundation, photograph: Nikolaus Brade. With the Foundation’s support, experts will produce new technical studies of original paint colors, analyze the character-defining features such as the steel-glass window constructions and nickel-plated fixtures, and explore the use of experimental materials that are no longer produced today. 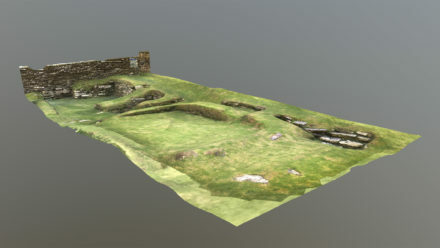 Research into the site’s extensive historical and technical records will be consolidated into a comprehensive database, which will be used to help prioritize future interventions. The Price Tower. Courtesy of Price Tower Arts Center, photograph: Christian M. Korab / Korab Photo 2003. Frank Lloyd Wright meticulously crafted every detail, inside and out, of the Price Tower—the sole skyscraper designed by the influential architect. This 19-story structure rises dramatically above the prairie landscape of Bartlesville, Oklahoma and embodies Wright’s signature style, blending architecture with landscape and relying on organic forms to align construction with nature. 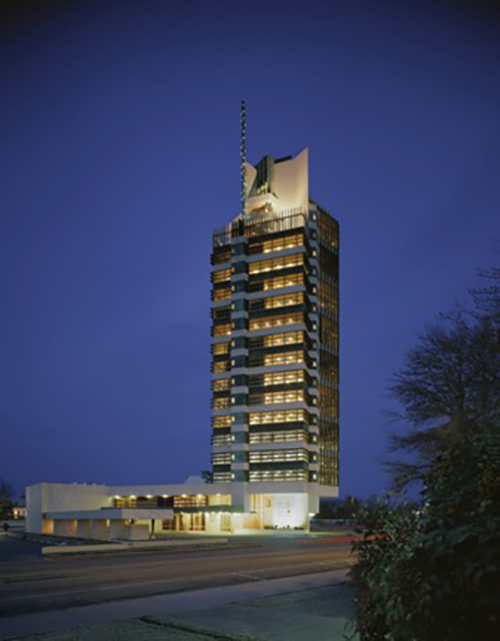 “The tree that escaped the crowded forest,” as Wright called it, the tower possesses a cylindrical core or “trunk” from which cantilevered floors project or “branch” out. Originally designed by Wright in 1927 as a trio of Manhattan apartment towers, the Price Tower we know today was begun in 1952, when Wright received a commission from Harold Price to build his oil pipeline construction company headquarters. Along with reducing the design to a single tower, Wright developed the interior spaces to be a mix of offices, shops, and residences. Like many of his other projects, Wright controlled nearly all of the design elements to produce a cohesive aesthetic. 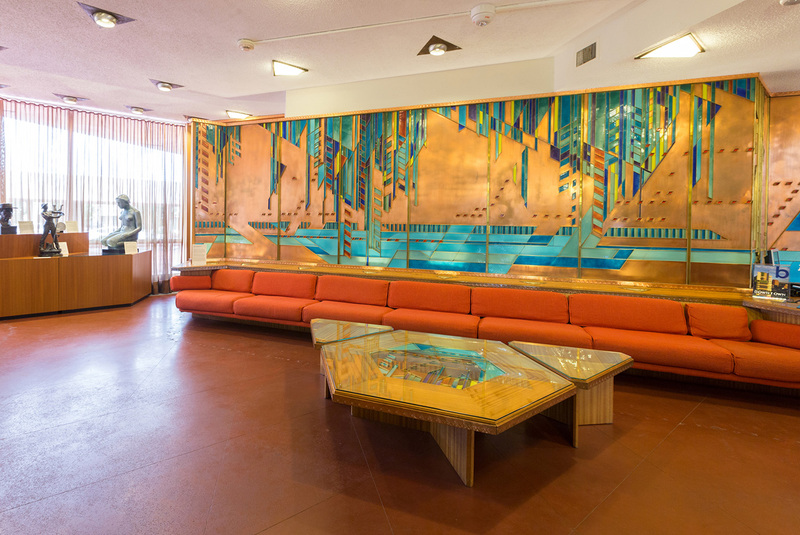 Much of the original furniture and surroundings—think the full thematic integrity of the sets in the early seasons of the TV series Mad Men—remain largely intact today. Phillips Petroleum purchased the building in 1981 and undertook a renovation of the tower’s mechanicals, plumbing, and electrical systems before donating the building to Price Tower Arts Center (PTAC). Price Tower reception and Frank Lloyd Wright mural. Courtesy of Price Tower Arts Center, photograph: Martha Ambler, 2016. Today, PTAC is working hard to preserve the tower as a living example of Wright’s architecture and so understands the building’s need for a comprehensive CMP. For example, the concrete exterior of the building is no longer weather tight and is beginning to allow water to migrate into the building. The exterior is also adorned with numerous art-deco details, and a sensitive intervention must take them into consideration. The CMP will provide a holistic view of the building’s long-term care and give experts insights into the building’s needs and challenges. 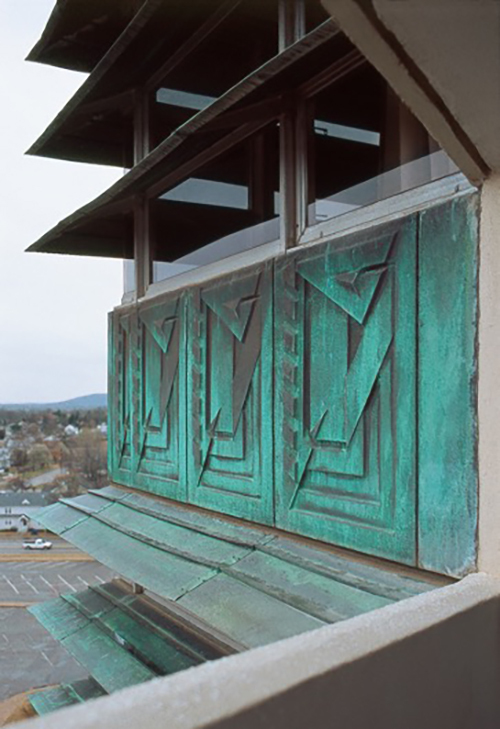 It will also deepen the field’s understanding of the skyscraper’s architectural significance and provide a conservation model for other modern buildings, especially those in Frank Lloyd Wright’s sizeable oeuvre. Copper louver and design. Courtesy of Price Tower Arts Center, photograph: Christian M. Korab / Korab Photo 2003. The conservation management plans that will result from these two grants are among many that are being produced with the Getty Foundation’s support. While serving the sites for which they are being produced, they will also provide a great benefit to the conservation field. The Foundation is currently developing a digital platform to make these plans, and all others that are created as part of Keeping It Modern, freely accessible online. Stay tuned for more news on this resource in the year ahead. I'm a program assistant at the Getty Foundation. 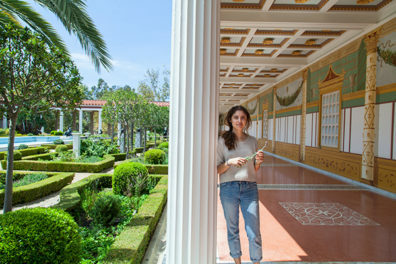 Five years ago I moved from London to Los Angeles to be a graduate intern in the Getty Villa's Education Department. Before returning to the Getty last year, I worked in education departments at museums across Los Angeles, including LACMA, the Skirball, and MOCA. At the Foundation I assist with the MOSAIKON and Panel Paintings initiatives and manage the Multicultural Undergraduate Internship program. I hold a master’s from the Courtauld Institute of Art as well as a bachelor’s from Stanford University. On weekends you can find me checking out the newest exhibitions around the city or hiking in the Santa Monica Mountains.